GAME CATEGORY: Card Exchange Game . GROUP OF GAMES: Card Passing Game. THE AIM OF THE PLAYERS: To discard all the cards except one with a girl (Emily), and the holder of this card loses. SIMILAR GAMES: Old Maid (western games); Akulina, Ved'ma (Russian games). AMOUNT OF PLAYERS: from 2 to 12. TIME TO PLAY: 4 - 10 minutes. CARDS: For 2-8 players use 32 cards (take away all cards with numbers 6, total of forty, from Six Generations 72-cards deck). For 6-12 players the entire 72-card deck is better. DEALING: From top of the deck, face down, clockwise, 1 cards to each player at a time, dealer deals out all the cards in the deck to the players. Note: after the dealer deals out all the cards to the players, some may have one more or less card than others - this does not matter. RULES: The players all look at their cards, and the player, who has a card #1 with a boy Jacob, discard it from the game. Then, all the players discard any pairs they have. A pair is two cards, a man (black card), and a woman (red card) from the same generation, from two to six. The player, who discard a card with Jacob, begins, by looking at the cards of the player right from her, who must offer the cards spread face down. That first player selects one card from this hand without seeing it, and adds it to her hand. If it makes a pair in her hand she discards the pair. The player who just took a card then offers her hand to the next player to her left, who also selects and pick up a card, and so on. If some players get rid of all their cards, they are safe - the turn passes to the next player and they take no further part. 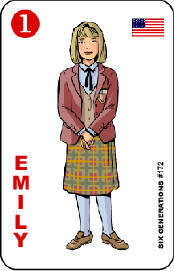 Eventually, at the end of Blind Date, all the cards will have been discarded except one card with a girl Emily, and the holder of this girl keeps it and loses. The holder of this card loses. The players discard any pairs they have (sample pair).